Imagine the ultimate online gambling destination where you can find everything you’re possibly looking for. This is exactly what the brand new Casino of Dreams is trying to achieve. 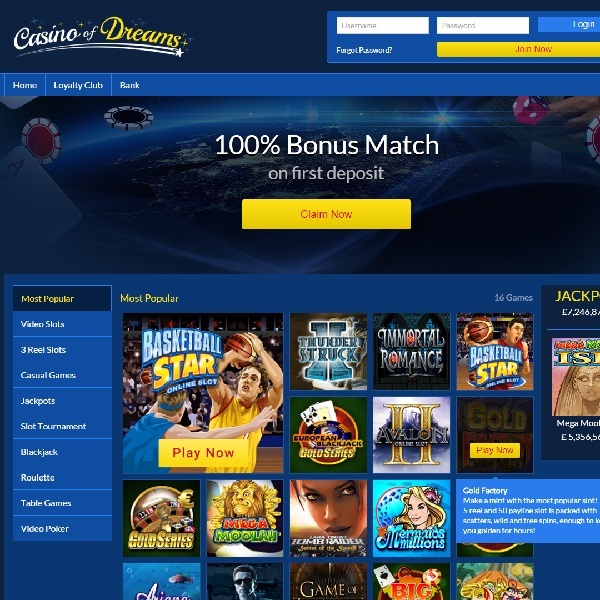 The casino is built on software from Microgaming and gives its members access to the developer’s full catalogue of games via its website. Members can enjoy a huge number of slots including 3 reel, video slots and many progressive jackpot games. There are all the standard card and table games on offer such as blackjack and roulette as well as video poker, casual games and more. New members at Casino of Dreams will receive a 100% first deposit bonus of up to £100 and then will receive weekly bonuses including free spins on leading slots, extra deposit bonuses and more. The casino is licensed in the UK and Malta and offers online support around the clock.